As the end of the college football season came to a close just a few weeks ago. All remaining college football fans begin to look toward the NFL draft that will take place in late April. This is the last time they will get to talk college football in relation to the 2009 season. Personally I go into a NCAAF coma that is only kept alive by the life-support of the occasional blurbs about my home team, the Georgia Bulldogs. 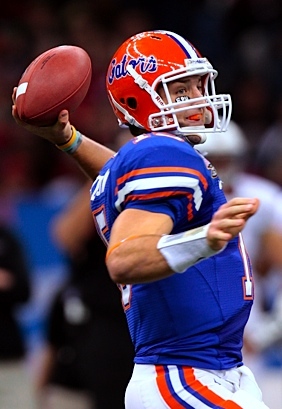 There has been much talk about Tim Tebow and his highly successful years as the Florida Gators quarterback and his next step into the NFL, negative talk that is. My purpose is not to get into the specifics of the criticism, but only to say that the criticism is over-rated for the most part in my humble opinion. I question the source and slant of the criticism from many. Besides the fact of being one of the greatest college football players of all time, Tebow is also known for his strong faith in Jesus Christ. His faith is mixed into every aspect of his football life such as interviews and scriptures references on his eye paint. 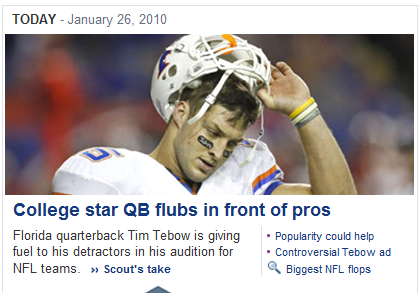 In reality, Tebow is the same type of person on the field as he is off the field. He doesn’t change his life to fit around his faith and visa versa. I can not think of a better role model for young kids and teens to aspire to be. Tebow works hard to keep his reputation as a Christian with integrity. In the days where sports celebrities are dropping like flies in drug and steroid use and the recent fall of Tiger Woods in multiple occurences of marital infidelity, Tebow is a breath of fresh air. The die-hard sports fans and critics can say that morals don’t matter on a football team, but that I believe is a lie and a cop-out given as an excuse to not like him because of his faith. I say that because of two reasons, first, if you were the father of a college or pro athlete would you want your son or daughter to live the life style of Mark Maguire, Barry Bonds, or Tiger Woods? Successful and rich, yes, but the lifestyle of drama I’m sure you would not wish on your own flesh and blood. Secondly, the NFL teams that draft these players would rather take a great player who is not known for “off the field antics” over a great player who is known for perhaps getting into trouble from time to time. These are there assets and they don’t want to have to worry about a player who causes trouble. Unless you are Jerry Jones and Al Davis, who are known for picking the “bad guys”, but hey, they are in the minority. Again if I asked you as a parent, would you rather have a son or daughter who are both successful in life, but one of them gets in trouble often, you have to bail them out of jail, constantly keep an eye on them to protect them, which would you choose? Need I say more? Yes, Tebow has some issues with his mechanics and perhaps with the NFL system that he hasn’t seen much of at Florida, but just watch come draft day, I will shave my head bald if Tebow is not taken in top 10 of the draft. Personally, I’m just glad he is no longer a Florida Gator, since I am a Georgia Bulldog fan. I can now get back to 100% hate for the Florida Gators instead of the 99% I had for them the last 4 years and I will enjoying hearing about his success in the NFL and his walk with Christ. This entry was posted on Tuesday, January 26th, 2010 at 4:38 pm and is filed under In The News, Religous and Life. You can follow any responses to this entry through the RSS 2.0 feed. You can leave a response, or trackback from your own site.